NATIONAL Semiconductor Corporation, represented by Arrow Electronics , has launched 10 new high-speed LMH amplifiers, featuring ultra-low distortion and wide bandwidth, for high frequency applications in the communications and video markets. National's latest LMH amplifiers are members of a new series of high-speed products based upon the VIP10 process. 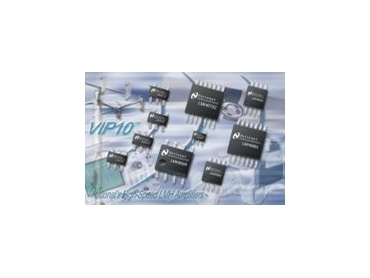 Developed in National's wafer fabrication site in Arlington, Texas, VIP10 is a high speed, dielectrically isolated, complementary bipolar IC process that utilises deep trench technology on a bonded wafer for complete dielectric isolation and optimal high-speed amplifier performance. VIP10 is the process technology that allows National to design the most power-efficient, performance-oriented high- speed amplifiers on the market today. Each of the LMH devices targets a specific market segment within the communications and video markets. They are available in a range of packages to accommodate customer needs. National's LMH6702 differentiates itself from the competition by offering ultra-low distortion of -79/-88dBc at 20MHz, wide bandwidth of 720MHz (2Vpp Av=+2), and a fast slew rate of 3100 V/us for driving heavy loads. The LMH6702 is targeted at the base station, multimedia and test equipment markets. The LMH6624 combines wide gain bandwidth (1.5 GHz) with very low output noise (0.92nV/rtHz, 2.3pA/rtHz) and ultra low DC errors, providing a very precise amplifier with wide dynamic range. The LMH6624 is optimized for high gain applications greater than Av=+10. It is targeted for applications in communications, audio, medical and instrumentation markets. National's LMH6732 allows adjustable AC performance from 0 to 1.5GHz with the addition of a single biasing resistor. The biasing resistor controls the supply current, which is adjustable over a fifteen to one continuous range. The LMH6732 is ideal for applications such as battery-powered video, test instrumentation and communications gear. The LMH6714 is a single operational amplifier, the LMH6720 is a single with 500uA shutdown, and the LMH6722 is a quad operational amplifier. All three products provide a 400MHz small signal bandwidth at a gain of Av=+2 and an 1800V/us slew ratewhile consuming only 5.6mA from + 5V supplies. National's LMH6657 and LMH6658 are single and dual, unity gain stable, high-speed amplifiers that feature voltage feedback technology. These devices feature wide output dynamic range and low power (6.2mA per channel). National's LMH6682 and LMH6683 are decompensated dual and triple 190MHz (Av=+2) voltage feedback amplifiers with fast slew rates of 940V/us and low differential phase and differential gain (0.03 percent and 0.05 degrees respectively). These devices are ideal for use in high speed, large signal applications such as consumer RGB video, instrumentation, communication devices and set-top boxes.